ArcelorMittal S.A. (French pronunciation: ​[aʁsəlɔʁmiˈtal]) is a multinational steel manufacturing corporation headquartered in Luxembourg City. It was formed in 2006 from the takeover and merger of Arcelor by Indian-owned Mittal Steel. ArcelorMittal is the world's largest steel producer, with an annual crude steel production of 92.5 million metric tonnes as of 2018[update]. It is ranked 123 in the 2017 Fortune Global 500 ranking of the world's biggest corporations. ArcelorMittal was created by the takeover of Western European steel maker Arcelor (Spain, France, and Luxembourg) by Indian-owned multinational steel maker Mittal Steel in 2006, at a cost of €40.37 per share, approximately $33 billion total. Mittal Steel launched a hostile takeover bid which replaced a previous planned merger between Arcelor and Severstal, which had lacked sufficient shareholder approval. The resulting merged business was named ArcelorMittal and was headquartered in Luxembourg City. The resulting firm produced approximately 10% of the world's steel, and was by far the world's largest steel company. Total revenues in 2007 were $105 billion. In 2010, the company's operating income had fallen to $4.9 billion, with sales down 10 percent from the year earlier, and income down 50 percent as steel prices slumped. In 2011, the company began curtailing its European production to match the reduced demand for steel. It also sold Skyline Steel and Astralloy to a rival, Nucor, for $605 million. On 26 January 2011, the stainless steel division split off as a new company, Aperam. As of 2012[update], due to overcapacity and reduced demand in Europe it had idled 9 of 25 blast furnaces; in October 2012 it permanently shut down two blast furnaces at Florange, France. On 31 October 2012, the company reported a third-quarter loss of $709 million as compared to a $659 million profit for the same period a year ago, citing the slow down in China's economy. In 2012 ArcelorMittal had $22 billion of debt. In January 2013, ArcelorMittal bid $1.5 billion to acquire ThyssenKrupp AG's rolling mill in Calvert, Alabama, United States. On 26 February 2014, ThyssenKrupp sold their Calvert carbon steel facility to ArcelorMittal and Nippon Steel for $1.55 billion, as a new joint venture. The facility was renamed AM/NS Calvert through the 50/50 joint partnership with Nippon Steel & Sumitomo Metal Corp. The firm also entered into a $2.2 billion contract to develop an iron ore deposit in Senegal. This included construction of a 750 km (466 mi) railway line. After stalling on the contract and failing to build according to schedule the Government of Senegal sued. In September 2013, the government of Senegal won a court case before an international tribunal to rescind a $2.2 billion deal with ArcelorMittal after the company suspended work on an iron ore mine in the country. In June 2014, the International Chamber of Commerce's arbitration court in Paris awarded Senegal $150 million. In 2015, the company had a net loss of $7.9 billion. Between February 2015 and February 2016, share value dropped 60%, making the company the "worst performer" in the FTSEurofirst300 index. The CEO said the company had performed poorly in 2015 due to "Chinese exports depressing prices." Early in 2016, the company announced it had raised $3 billion in new investment capital to help reduce debt to $11.7 billion of debt. In early 2016 the company also announced a program to boost core profit by $3 billion by 2020 "through a mixture of cost-cutting, increased production and a focus on higher-value forms of steel." Chairman Lakshmi Mittal announced doubled earnings the following year in May 2017. Along with the increase in capital, the company also sold its 35% stake in Gestamp Automacion for $979 million, with the goal of reducing ArcelorMittal's debt to less than $12 billion. By February 2016, the company made about 6% of the world's steel. It ranked 108th in the 2016 Fortune Global 500 ranking of the world's biggest corporations. In February 2017 ArcelorMittal announced its first annual profits in five years. In February 2017, ArcelorMittal and Votorantim announced plans to combine their long steel operations in Brazil. Under the deal, Votorantim Siderurgia became a subsidiary of ArcelorMittal Brasil. In late May 2017, ArcelorMittal and the Steel Authority of India Ltd (SAIL) agreed on preliminary terms to form a $913 million joint venture to export a fifth of the auto-grade steel made by the venture. In March 2017, the company proposed a new US$6.5 billion steel project in Karnataka, after entering into a pact with the Karnataka government in February 2017. In April 2017, Sanjeev Gupta's Liberty House Group announced it had agreed to acquire ArcelorMittal's Georgetown Steelworks in South Carolina. It is ranked 123 in the 2017 Fortune Global 500 ranking of the world's biggest corporations. By March 2017, ArcelorMittal was leading a consortium bidding for Ilva. An Italian company, Ilva owns the Taranto steelworks in southern Italy, which has Europe's largest steel output. The steelworks had been accused of toxic emissions linked to local cancer rates, and had been nationalized by the government years prior. The buyers were the AM Investco consortium, which beyond ArcelorMittal included Marcegaglia and Banca Intesa Sanpaolo. In May 2017, ArcelorMittal was announced as the preferred bidder over a different consortium led by JSW Steel, after it was able to pledge a production increase and guarantee employment levels. The final decision was waiting on Italy's ministry of economic development. On 5 June 2017, ArcelorMittal won approval to purchase Ilva for €1.8 billion. In its bid, AM Investco had pledged to make investments into Ilva of €2.4bn until 2023. On 1 November 2018, ArcelorMittal assumed ownership of Ilva steel operations and ArcelorMittal Italia was formed. In July 2017 the company reported a 19.3 per cent year-on-year rise in its earnings for the year's second quarter. Also, that month European Court of Justice ruled against ArcelorMittal in its lawsuit against how the EU allocates free carbon permits. The amount was lower than predicted by analysts, with the company citing the volatility in market prices. The company is involved in research and development, mining, and steel. ArcelorMittal in 2016 produced around 90 million tons of steel. As of May 2017, the company made 200 unique steel grades for automotive purposes, half of which were introduced since 2007. Among the steel varieties are Usibor 2000, which the company announced in June 2016 and released later that year. Upon release, the high-strength automotive steel was said to be about one-third stronger than other steels then available for carmaking. 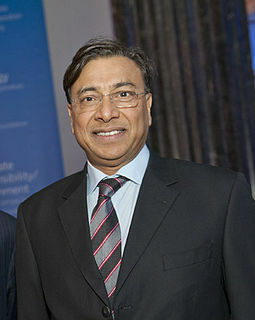 Lakshmi Mittal (owner of Mittal Steel) is the chairman and CEO. His family owns 40% of the shares and voting shares in the company. After a $3 billion rights issue earlier in April 2016, the company by 21 April 2016 had a share value of 16,616 million euros, distributed in 3,065,710,869 shares. As of 2012, the company had thousands of workers at 12 major facilities in the United States, in states such as Indiana, Ohio and Pennsylvania. All non-salary employees in North America, with the exception of the Dofasco facility in Hamilton, Ontario, are represented by the United Steelworkers union, the largest industrial union in North America. Also, at the time around 100,000 of the company's 260,000 employees were in Europe. As of 31 December 2013, the company employed over 232,000 people, of which 37% were in the EU, with a further 16% in non-EU European countries, 17% in Asia, 16% in North America, the remainder split between South America and the Middle East and Africa. ArcelorMittal is also Luxembourg's largest private employer. At the beginning of 2014, it employed 4,600 employees in the Grand Duchy. ^ a b c d e "FY 2016 Results". ^ a b c d e f "World's Biggest Steelmaker Raising $3 Billion As Profits Plunge". Fortune. 5 February 2016. ^ a b "Annual Report 2018 on Form 20-F ArcelorMittal". ArcelorMittal. ^ "ArcelorMittal, Nippon Steel buy ThyssenKrupp's U.S. factory". Japan Today. Retrieved 1 December 2013. ^ a b Finch II, Michael (26 February 2014). "Sale of ThyssenKrupp Steel USA clears all regulatory approval". Press-Register. Mobile, Alabama. Retrieved 26 February 2014. ^ a b Felix, Bate (6 June 2014). "UPDATE 1-Senegal to receive $150 mln in damages from ArcelorMittal". Reuters. ^ Powley, Tanya (6 November 2014). "ArcelorMittal boosted by pick-up in steel business". Financial Times. United Kingdom. Retrieved 8 June 2017. ^ Hornby, Lucy (15 June 2014). "ArcelorMittal's path to China not paved with steel". Financial Times. United Kingdom. Retrieved 8 June 2017. ^ Smith, Carin (22 August 2016). "ArcelorMittal to pay R1.5bn price fix fine". Fin24. Retrieved 23 August 2016. ^ "European Commission - Press release - Antitrust: Commission fines prestressing steel producers € 269 million for two-decades long price-fixing and market-sharing cartel". Europa.eu. 4 April 2011. ^ a b c d Pooler, Michael (11 March 2016). "ArcelorMittal outlines terms of $3bn rights issue". Financial Times. United Kingdom. Retrieved 8 June 2017. ^ a b Pooler, Michael (5 June 2016). "ArcelorMittal to launch new high strength steel". Financial Times. United Kingdom. Retrieved 8 June 2017. ^ McClean, Paul (12 May 2017). "ArcelorMittal doubles earnings after cost-cutting drive". Financial Times. United Kingdom. Retrieved 8 June 2017. ^ a b c Pooler, Michael (23 February 2017). "ArcelorMittal and Votorantim to combine Brazilian long steel operations". Financial Times. United Kingdom. Retrieved 8 June 2017. ^ "ArcelorMittal, SAIL agree to mediator's proposal to advance Indian venture". The Economic Times. India. 31 May 2017. Retrieved 8 June 2017. ^ a b "Indian-origin tycoon Sanjeev Gupta to acquire ArcelorMittal's US unit". The Economic Times. India. 21 April 2017. Retrieved 11 June 2017. ^ "ArcelorMittal plans solar farm on steel plant land in Karnataka". Economic Times. India. 26 February 2017. Retrieved 11 June 2017. ^ a b Pooler, Michael; Politi, James (5 March 2017). "Bidding race to win Europe's biggest steel plant heats up". Financial Times. United Kingdom. Retrieved 8 June 2017. ^ a b c d Pooler, Michael (6 June 2017). "ArcelorMittal wins race to buy Italian steel business Ilva". Financial Times. United Kingdom. Retrieved 8 June 2017. ^ Pooler, Michael; 26 May 2017 Politi, James. "ArcelorMittal-led group leads race to buy Ilva steel plant". Financial Times. United Kingdom. Retrieved 8 June 2017. ^ Alistair Holloway (July 2017). "ArcelorMittal earnings rise less than expected". Luremburger Wort. Retrieved 30 July 2017. ^ Andries Mahlangu (27 July 2017). "ArcelorMittal SA sinks deeper into the red". Business Day. Retrieved 30 July 2017. ^ "ArcelorMittal reports that automakers are using more steel as quality improves". Chesterton Tribune. 16 May 2017. Retrieved 8 June 2017. ^ a b "LTV Steel assets sold". CNN Money. 27 February 2002. ^ "Dofasco recommends acceptance of Arcelor bid". CBC News. 24 January 2006. ^ "Les plus gros employeurs du Luxembourg sont..." Les Sentinel. France. 2 July 2014. ^ DePass, Dee (31 December 2019). "ArcelorMittal takes over Hibbing Taconite management from Cliffs". Minneapolis Star-Tribune. Retrieved 4 January 2019. ^ a b "Algeria: Government takes over steel production from ArcelorMittal". North Africa Post. 8 October 2013. Retrieved 11 June 2017. ^ "ArcelorMittal and Nippon Steel Corporation Announce $240 million Expansion at I/N Kote in New Carlisle, Indiana". Bloomberg L.P. 16 April 2008. Archived from the original on 4 March 2014. Retrieved 26 February 2014. ArcelorMittal Dofasco is a steel company based in Hamilton, Ontario, Canada. Dofasco is a standalone subsidiary of ArcelorMittal, the world's largest integrated steel producer. Lakshmi Niwas Mittal is an Indian steel magnate, based in the United Kingdom. He is the chairman and CEO of ArcelorMittal, the world's largest steelmaking company. Mittal owns 38% of ArcelorMittal and holds an 11% stake in Queens Park Rangers F.C..
Wuhan Iron and Steel (Group) Corporation (WISCO), is a Chinese state-owned enterprise. It started to operate in 1958 in Qingshan, Wuhan, Hubei, China. Severstal is a Russian company mainly operating in the steel and mining industry, headquartered in Cherepovets. Severstal is listed on the Moscow Exchange and LSE and is the largest steel company in Russia. The company is majority-owned and controlled by billionaire Alexey Mordashov. Thyssen was a major German steel producer founded by August Thyssen. After over 100 years of existence, the company merged with Friedrich Krupp AG Hoesch-Krupp to form ThyssenKrupp in 1999. Calvert is an unincorporated community and census-designated place in Mobile and Washington counties, Alabama, United States. It is located in the extreme northeastern corner of the county near the Tombigbee River, along U.S. Route 43. As of the 2010 census, its population was 277. Nippon Steel Corporation , was formed in 2012 with the merger of Nippon Steel and Sumitomo Metal. Nippon Steel was formed in 1970 with the merger of Fuji Iron & Steel and Yawata Iron & Steel. Nippon Steel Corporation is the world's third largest steel producer by volume as of 2017. ArcelorMittal Bremen is a steelworks on the banks of the River Weser in Bremen, Germany. Ilva is an Italian steelworks company.